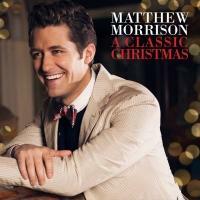 Matthew Morrison - A Classic Christmas - Gordon Lightfoot Book, Music and More! Earlier this year, Morrison revealed his Broadway roots with Where It All Began, a collection of songs from his favorite musicals. Now the star of TV’s Glee shows his fondness for seasonal songs. Working with producer Phil Ramone, he recorded six tracks with a 60-piece orchestra at Capitol Records where Frank Sinatra made his best albums. “That’s why we called it A Classic Christmas,” Morrison explains, “because it’s very classic in the way they used to record.” Crooning his way through Yuletide nuggets like “Let It Snow” and “O Holy Night,” Morrison injects a fresh sound into those well-known songs. He even brings the kind of enthusiasm you’d expect from Will Schuester, his super-positive Glee character, to “It’s the Most Wonderful Time.” Morrison closes with “I’ll Be Home for Christmas,” before switching over to the joyous, Hawaiian-style “Mele Kalikimaka.” Fun and infectious, the collection is the perfect primer for the holiday season.